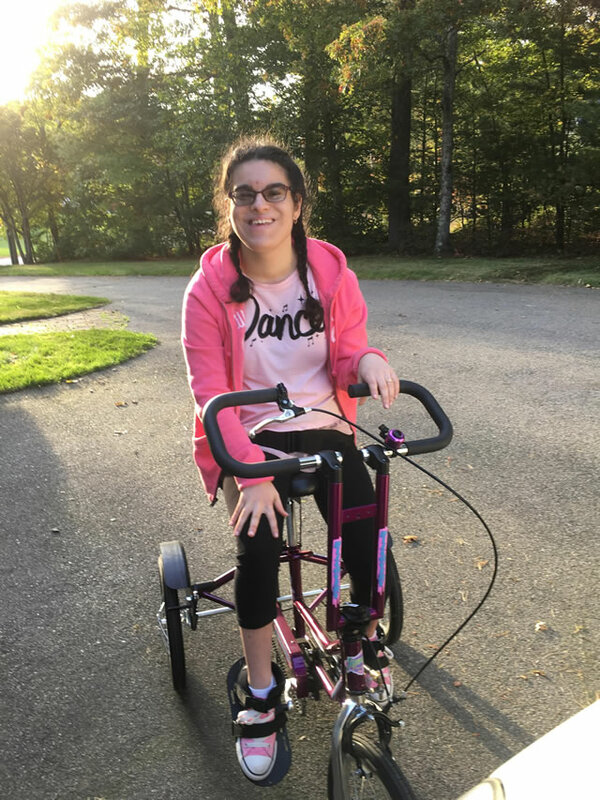 H.A.L.O.’s Family Circle, in Partnership with Jewish Family & Children’s Service of Boston, also offers the Family Circle Newsletter and supports the Disabilities Resource Network. Each month the Family Circle newsletter provides a wealth of up‐to‐date information about services, benefits, support groups, workshops, and other resources to help families meet the challenges of raising a child with disabilities. To sign up visit www.jfcsboston.org. 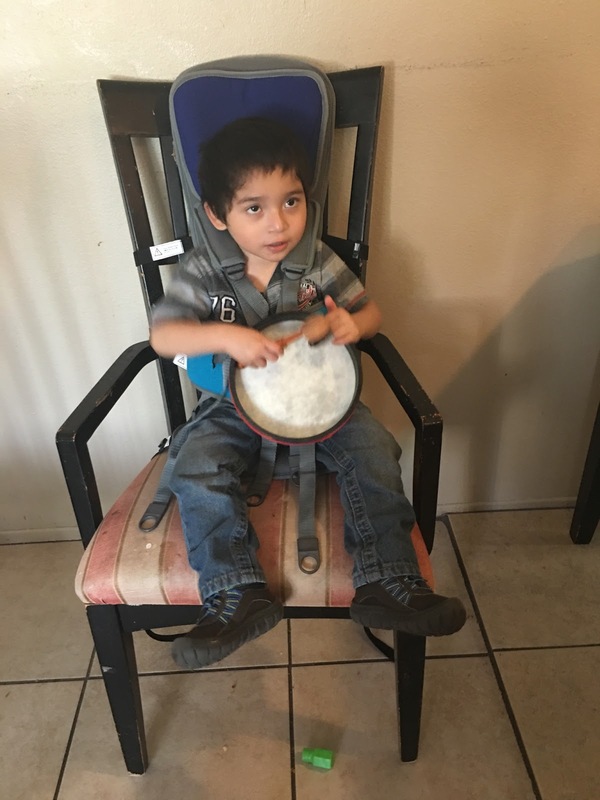 Abishai, 3, has outgrown high chairs but needs support to stay upright. H.A.L.O. purchased a Firefly Go To Seat. Now he can bond with his family during meal times. Mykala needed more activity to strengthen her legs. H.A.L.O. 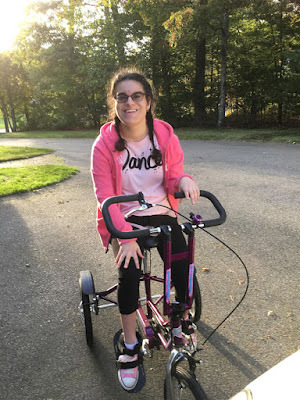 helped her family purchase an adaptive tricycle. She is very enthusiastic about going for a ride now. Since H.A.L.O. helped his family obtain a Triad Imp Special Needs Tricycle, which Mason calls “Orange Crush,” he is working hard on separating leg movements to control the bike. 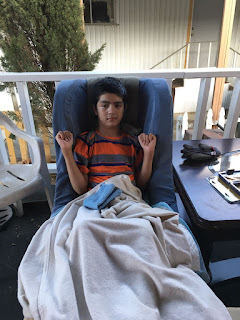 When Eduardo needed this special chair to sit upright comfortably, H.A.L.O. contributed toward its purchase. The H.A.L.O. Foundation is marking a quarter century of outreach, comfort and support for children physically and socially isolated by severe neurological impairment. Our programs have evolved as we have learned more about the impact brain devastation has on individuals and their families, and I encourage you to read about them in this report. At this time, I am pleased to announce the inauguration of a new, non-denominational program, Sib Shops, in conjunction with our long-time partner, Jewish Family & Children’s Service of Greater Boston. Beginning in January we will sponsor six workshops for typically– developing siblings of children with severe neurological disabilities, to coincide with the Sunday Swim & Sing program. Sib Shops is a national program that recognizes it isn’t easy to be a brother or sister to a child with special health concerns. A licensed social worker will accompany participants on recreational adventures such as a visit to a trampoline park, and spark conversations designed to help participants to express their feelings and concerns. There is no magic cure (yet) to reactivate or regenerate brain cells destroyed by illness, abuse, birth defect or accident. H.A.L.O. pledges its continued efforts to ease daily life for children with neurological afflictions and support for the families who are invested in their happiness. The H.A.L.O. Foundation was honored as a 2017 CHAI Champions by Jewish Family & Children’s Services of Greater Boston. 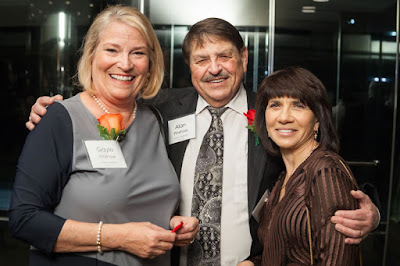 Founders Gayle Pinshaw and Alan Pinshaw, M.D. , pictured with Rimma Zelfand, CEO, accepted the tribute. On November 5th the Help A Little One Foundation was recognized as a 2017 CHAI Champion for its work as an extraordinary advocate for people with disabilities. “The H.A.L.O. Foundation provides respite services to families who greatly need a break from the job of bringing up a child with disabilities,” said Rimma Zelfand, Chief Executive Officer at Jewish Family & Children’s Service. JF&CS honored 18 organizations and individuals who support and embrace individuals with disabilities, and foster their growth and independence. The biennial award is named for the agency’s most enduring program: Community Housing and Adult Independence. H.A.L.O. first partnered with JF&CS in 1999 to offer the Family Circle program. Initially the goal was to establish a “circle of friends” for at-home caregivers of children with neurological challenges. The Sunday Swim & Sing respite program was born when it became clear that the families were desperate for a break from their demanding responsibilities. 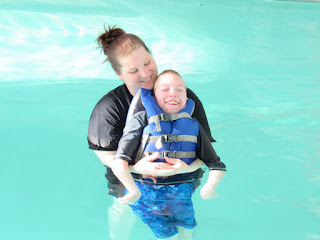 Laurie Gershkowitz, parent of a participant for the past three years, said Swim & Sing is “a huge help” to her family, It combines two of her son Jake’s passions, swimming and music, and offers a “typical” experience not widely available for people with disabilities. For 25 years the H.A.L.O. Foundation has strived to enhance quality of life for children with neurological disease, said Founder Alan Pinshaw. By extending our umbrella to support caregivers of medically fragile children at home, it makes everyone’s life better. Learn more about Sunday Swim & Sing. For information on JF&CS please visit www.jfcsboston.org. H.A.L.O.’s legal initiative, the Children’s Advisory Network (CAN) was barely off the ground in 2010 when a family that was in imminent danger of losing services for their child asked for help. With just one day remaining for an appeal, a volunteer lawyer prepared a letter of advocacy that made the Massachusetts Department of Health aware of important information, and the child’s eligibility was restored. H.A.L.O. 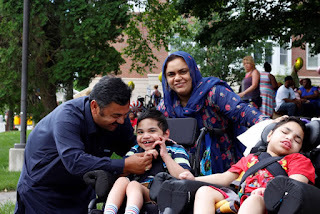 CAN was established in 2010 to help families navigate the complex regulations governing care of people with disabilities in Massachusetts. H.A.L.O. board members Rebecca L. Dalpe, and Arthur Sneider, both attorneys, are part of a group that responds to legal questions as needed. “When a regulatory body denies benefits children are legally entitled to, we help families challenge these decisions,” Becky Dalpe explained. Families can be overwhelmed by their child’s disabilities, or they find these quasi-legal issues too complex to deal with on their own, she explained. Some families also worry that an appeal will cause termination of other services. Most of her recent assistance has involved Department of Public Health denials for short term respite stays at nursing homes. Becky’s private law practice includes medical malpractice defense, health care law and representation of medical professionals before regulatory boards, agencies and committees. H.A.L.O. CAN volunteers are licensed, experienced professionals who specialize in Massachusetts disability and advocacy law. There is no fee for families who qualify. If family needs exceed the volunteer capacity, a list of law firms that specialize in advocacy for children with complex neurological and physical conditions is available. As I reflect on H.A.L.O.’s 25 years of service, I am reminded of the Hebrew term "Tikkun Olam", which literally means "repair of the world." We have all experienced our share of sickness, death, and disappointment. H.A.L.O.’s legacy is a reminder of our ability to transform. Let us shine light into darkness, turn bitter to sweet, and repair the broken pieces of the world around us. Thank you to everyone who has contributed to H.A.L.O over the years, and a special thank you to my father for 25 years of tireless commitment to H.A.L.O's mission and success! When H.A.L.O. started 25 years ago, I don't think anyone could have predicted this level of success. I'm so proud of the hard work contributed to H.A.L.O. by so many but particularly by my parents. When Sarah got sick, they had every right to curl up and shut down, but instead they chose to turn their own pain into an opportunity to improve life for others. The number of lives touched by H.A.L.O. is a testament to their ongoing strength, love and dedication. I feel very proud and privileged to be affiliated with H.A.L.O. Keeping families connected is important to H.A.L.O. Twenty-five years ago Sarah’s family was inspired to make life more comfortable for children with severe neurological conditions in pediatric nursing homes in New England. They created the H.A.L.O. Foundation to gift teddy bears and television sets to kids who needed a little comfort or stimulation, and instituted an annual gifting program for staff to purchase uniquely special gifts for each child. Soon appropriate technology for entertainment, toys for the pool and extracurricular fun were included. H.A.L.O. underwrites gifts and programs that have a direct impact on children or promotes interaction and acceptance in the greater community. at the beach with medical support for their children. H.A.L.O.’s generosity to the residents at Seven Hills has enabled us to choose individualized gifts for them on their special holidays. It has also been our go-to resource for children in dire need. Some emergency admissions arrive with only the clothes on their backs. When their needs exceed the personal account funds the state supplies, we draw on the gift funds from H.A.L.O. One of the gifts many children have enjoyed are colorful character sheet sets to personalize their bedroom space. Whether its Peppa Pig or Star Wars, it makes their rooms cozy and welcoming, just like at home. Our children’s needs vary greatly. Some lack for nothing. Others might need a hairdryer or raincoat, or nail polish to add sparkle to their day. We tailor the gifts we purchase on H.A.L.O.’s behalf to each individual and try to make it special. and toys from H.A.L.O. make it even more fun. We are so grateful at Cedarcrest for the H.A.L.O. Foundation! In our view, children with complex medical and developmental needs are in many ways like all children. They need support, respect, compassion and loyalty. Throughout the last 25 years, the children in our care have received this and more tangible items from the H.A.L.O. Foundation. 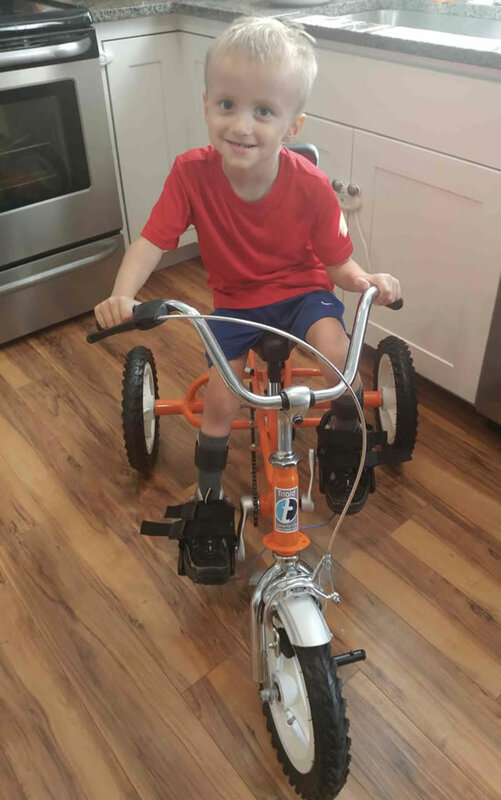 H.A.L.O.’s generosity has included gifts such as a Pony Gait Trainer for mobility; an FM system to boost a child’s hearing and the opportunity to experience fun activities that most other children have during the summer through Camperoni. Whether the children are with us for long term or short-term (respite) care, we embrace them for all of their abilities and fragilities. Above and beyond the medical technologies we employ, having what we need to educate, inspire and entertain the children is just as vital to their well-being. Smartboards, communications switches, hand-held devices such as iPads all positively influence the children’s day. We are so grateful to the H.A.L.O. Foundation for understanding the needs of the children in our care and the Foundation’s consistent support that ensures the highest quality of life for them. As the name implies, the H.A.L.O Foundation has infused the NEPC community with their illumination. Over the past 25 years, they have demonstrated honor, reverence, glory and veneration through their endless support and generosity. 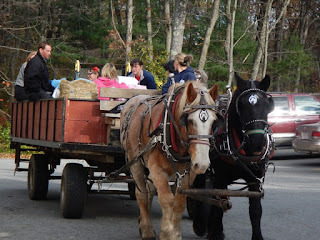 This has ranged from providing clothing and personal items to holiday gifts, wheelchair accessible hayrides, communication devices and the remarkable and magical experiences of family vacations on Cape Cod. Their gifts have not only provided many of the essentials for quality of care, but they have gone above and beyond and have gifted the experience of family, community, healing, magic, joy and wonder. The residents, staff and families of New England Pediatric Care are forever tremendously grateful. As we enter this holiday season, the residents and staff of Plymouth Rehabilitation & Healthcare Center have much to be thankful for. We would like to thank the H.A.L.O. Foundation for all their support over the many years. Because of their generosity, our young residents have the most wonderful Christmas Day. H.A.L.O.’s focus on quality of life is an example to our community’s many caring volunteers who also enrich the lives of our students. Even though our residents participate in many field trips throughout the year to events such as Paw Sox games and the Museum of Science , we need organizations like H.A.L.O. 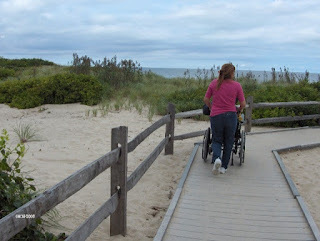 to help our kids experience the wonders of the world beyond their wheelchairs. The possibilities are limitless with new technology and we are excited to take these journeys together. a participant at a Sunday Swim & Sing session. H.A.L.O.’s popular Sunday Swim & Sing program was revamped over the summer and is now open to more participants. 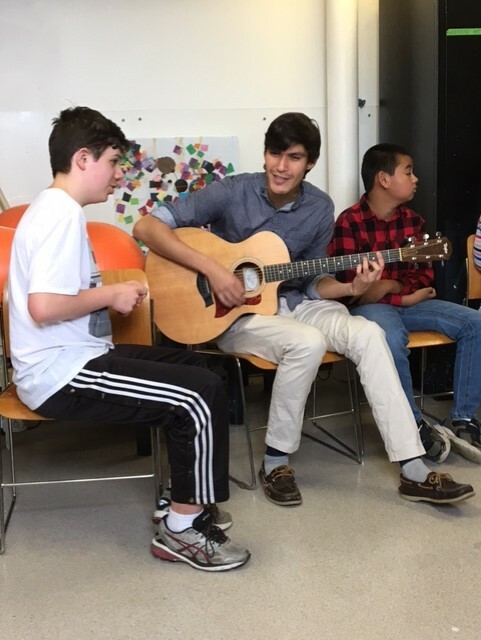 The three-hour respite program offers professional music therapy and lifeguarded swimming with one-to-one support staff for up to eight young people with various neurological impairments. A new family component welcomes five more individuals with disabilities to participate with family support. Therapeutic recreation contributes to a person’s physical, social and all-around quality of life, according to extensive research. It also promotes parity for people with special needs, who are commonly defined and limited by what they cannot do. Those benefits were a strong impetus for H.A.L.O. to address the problem of the Swim & Sing wait list – up to 60 families at times – and remove barriers to growth. “We have long wanted to expand the program, but the weekend schedule and the complex nature of developing relationships with the participants made it challenging to recruit and retain staff for a three-hour weekly commitment for a year,” according to Wendy Wilsker, Senior Vice President of Institutional Advancement at Jewish Family & Children’s Service. JF&CS is H.A.L.O.s partner in its Family Circle outreach program and has managed Sunday Swim & Sing since its 2005 inception. This summer the drop-off model was put on hold to test whether family members could successfully extend resources to more individuals. The solution came with a new opportunity to share staff between programs. Offering the aides more hours made the positions more attractive and alleviated hiring challenges, she explained. This fall Sunday Swim & Sing was reinstated as a hybrid model to provide respite and to embrace families who wished to participate with their children. Berklee-trained music therapist Lyle Shaw engages all participants in a one-hour joint session of participatory music, evoking smiles as individuals respond to sounds and rhythms. After appropriate snacks, everyone heads to the locker room and accessible pool. “The experience extends benefits to everyone involved,” said Angela Waring, CRC, MS, Respite and Recreation Program Manager and Director of the Sunday Swim & Sing program. Additionally, the sessions provide opportunities to develop friendships among peers, and integrate those with disabilities into the greater community. Angela said members and staff at the Levanthal-Sidman Jewish Community Center in Newton, MA, and the YMCA in Stoughton, MA have been inclusive and helpful. Swim & Sing is offered 20 Sunday afternoons per year. For details, including sign-up and scholarship information, contact Angela at awaring@jfcsboston.org or call 781.697.7232 . We as a family have survived, changed, grown and even thrived since that sad and difficult time in 1991 when Sarah first fell victim to meningitis and then to encephalitis. Thinking back, I remember the days and nights spent at the hospital and the fear and uncertainty that were our daily companions. For many months, when I stepped out of the elevator on the neurology floor, my stomach would clench and my heart would race as I imagined what might await me around the corner. 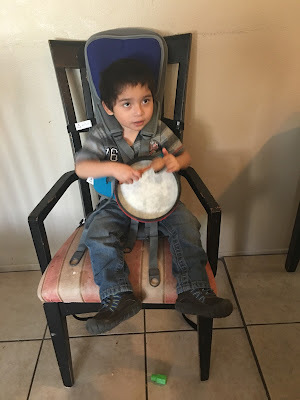 I remember my toddler thrashing uncontrollably as a result of neurologic dysfunction, of being fed formula mixed with corn oil to try and keep up with caloric needs. I remember the placement of her feeding tube. I remember her being “slept” for weeks without end into an artificial coma with potent drugs. I remember her, in a neurologic “storm”, biting off her own tongue. I remember the day that I realized that she was blind. I remember two other children hospitalized with encephalitis, dying. I remember bringing my two healthy, sad, confused and terrified children to stand next to her bed and talk to her, pretending all was well. I remember the dance, two steps forward and three steps back. I remember Sarah’s respiratory failure, her tracheostomy tube being placed, her cardiac arrest. I remember my husband, as a physician being stoic, but understanding full well what was happening. I remember myself being doggedly optimistic and not understanding, at all, what was happening. Ultimately Sarah went to live in a pediatric nursing home. She lingered for many years in an unresponsive “vegetative state”, enduring pain, illness and pneumonias, seizures, dislocations, surgeries. We struggled to keep body and soul together, and adjusted to the new reality. Alan was inspired to create H.A.L.O. to enhance quality of life for children like Sarah, and to an extent it helped us heal. Seven years further into our journey, I thought I saw Sarah trying to smile. Alan assured me it was just gas or wishful thinking but as years passed I became more convinced I saw it. But was it an authentic smile or another neurological aberration? Now, 25 years down this bumpy road, I am pleased to report that Sarah is definitely smiling - and frowning and crying - with intention. After her tracheostomy tube was removed about two years ago, she started to make sounds, randomly at first and now with intention, on command. She even chortles with intention. Does she understand? Fool or optimist that I am, I think she might. 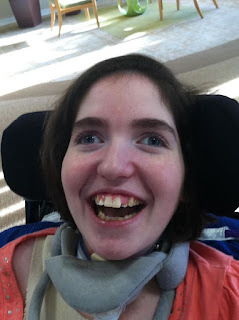 I am realist enough to know that Sarah’s life is fragile and her condition complex. Julie and Danny have grown up. Sarah has just grown. Despite her challenges, she has managed to outlive her life expectancy and for that we are grateful. We visit Sarah two or three times a week. Sometimes I beat myself up thinking that it is not enough. What if we could do more to make her happier? 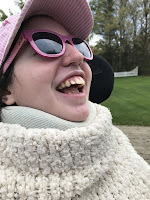 I console myself with the thought that had Sarah’s life been “normal” she would have long since flown the nest and we would be seeing much less of her as she pursued her dreams. I would gladly wish that for her. We are blessed to have Sarah in our lives for as long as she is able. She is safe and well cared for and well loved. I can’t ask for more.